While living in Rio de Janeiro our family enjoyed visits to the statue of Christ the Redeemer. You might have guessed it—we frequently ended gazing upwards at the Christ with visiting friends. The statue is perched on the peak of Corcovado Mountain and looks over Rio and the Bay of Guanabara. O Cristo Redentor stands with arms outstretched as if it were embracing the city. If we paused for a moment while looking up and recall what we know about the Christ we might easily feel those arms were stretched out to us in love and compassion. 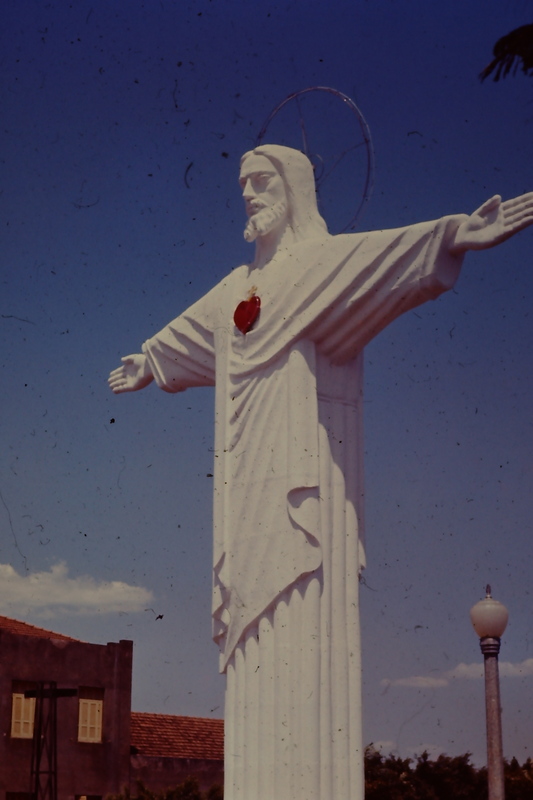 This statue is from another city but is the exact copy of the Cristo Redentor in Rio. 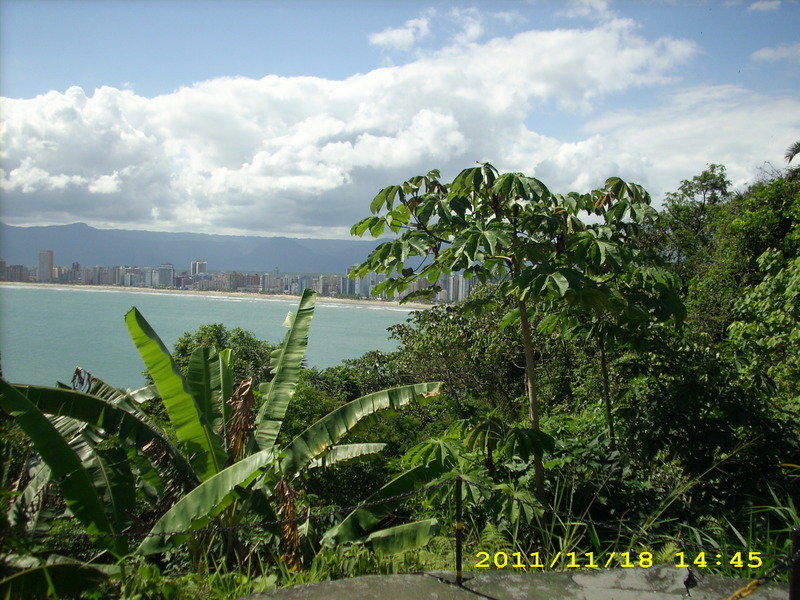 The mountain of Corcovado rises to 2,300 feet or 690 meters over the city, the Bay of Guanabara and the city’s beaches. The meaning of Corcovado is hunchback and refers to its shape that makes it a nearly impossibility for climbers. The statue itself stands 100 feet on a 20 foot pedestal and weighs 700 tons. At night powerful lights transform this statue into a protective presence. No matter where we stand and gaze from the city below toward O Redentor, faith easily reaches into our hearts. The last time I visited this statue was with a work group that we had organized to help in the construction of one of our churches. We used taxis to climb the winding road up through the forest and that gave us the opportunity to see butterflies and birds that made their home in the jungle. As we stood looking over the city below and the Sugar Loaf mountain across the Bay of Guanabara, in the distance a helicopter took off below us and rose to circle the statue; I am sure it’s payload was tourists. There is another way to ascend through the jungle to get the feet of the Christ and that is to take the cogwheel train built long ago in 1885. Trains leave the Cosme Velho station every thirty minutes for the 17 minute ascent through the forest cover with the added attraction of a good vie w of the famous Ipanema and Leblon beaches. Still there was a different way our family often used for we would come from the South, the opposite direction from downtown Rio . 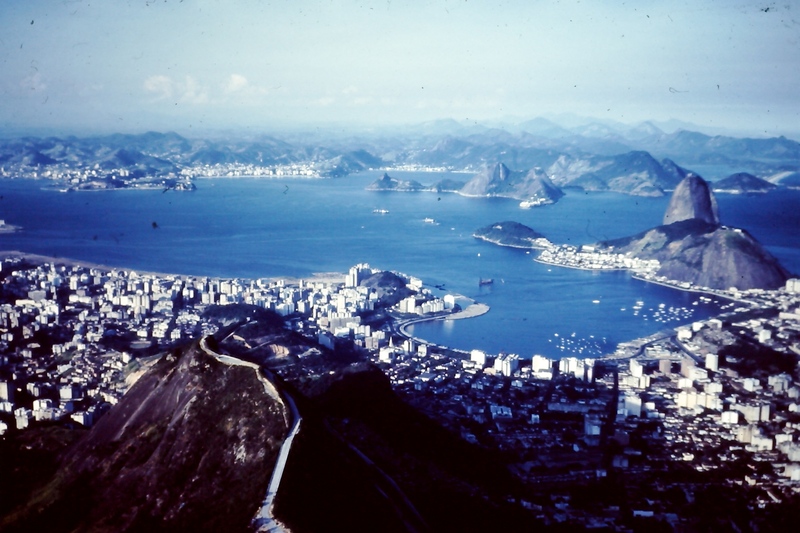 Vernon then four and Monica six would pile into the little Renault and travel East from our home to the top of the range of mountains known as the Tijuca Forest. To get to O Cristo Redentor we turned North and wound through untamed jungle. Along that ridge a spring flowed out of the hills and down to the road. We’d pile out to have a drink and fill any water bottles. From the narrow road through the trees, along the summit and through the branches and leaves we could see the stature. As well lookout points gave us views of famous beaches, the Freitas lake, the Jockey club and the Emperor’s Table. That high flat rock interests us for it is thought to be the landing site for extra-terrestrials. In any case this bit of history is true–Brazil’s last emperor Dom Pedro II took his court there for picnics. Something moves deep within me every time I have been in the city of Rio and looked upwards to the Redeemer. Ah, there is something more magnetic yet happening for the Christ himself, yes the Christ himself draws everyone of us to bow in awe at His feet. This entry was posted in Uncategorized on March 14, 2018 by rkenny2014.